This combo is extremely unreliable—but the pay-off is worth it. Hearthstone has had some pretty inventive one-turn-kills throughout its history. Some of those have been viable or even dominant, like Patron Warrior, Combo Druid, and Freeze Mage. Nowadays Quest Mage is your best chance to pull one off in a real game. But if you really want to play a deck that can destroy an opponent in the blink of an eye, there are still options out there. They just aren’t very consistent. Most of these decks live in Wild, thanks to one card that opens up a ton of possibilities—Emperor Thaurissan. When Thaurissan was released in the Blackrock Mountain set, it was a gamechanger. The card allowed every class access to relatively consistent card discounting, and opened up a world of possibilities for what could be played in a single turn. The possibilities were almost endless. For those who hate combo decks, Thaurissan rotating into Wild was a blessing. And it does mean that those who wish to play around with insane combos can do so in an environment where they don’t have to care about the Standard meta. One player chasing this particular high is “HysteriA”, the YouTuber behind the popular Hearthstone Mythbusters series. In his latest video, HysteriA looks at one of the most ambitious combos in the game—the Jaraxxus OTK. The combo revolves around a simple principle. 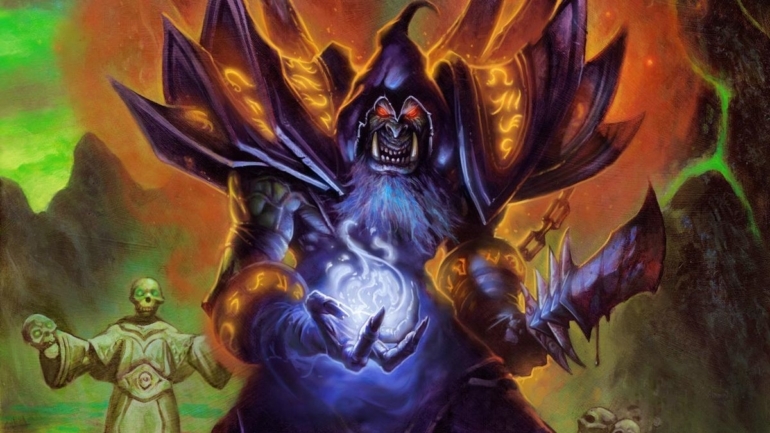 When played, the Warlock legendary Lord Jaraxxus takes the place of your hero. You can then be instantly killed by the card Sacrificial Pact, which destroys a demon. The combo wants to give your opponent Jaraxxus before the hero swap happens, turning your opponent into Jaraxxus, and hitting them with Sacrificial Pact. But the setup is anything but easy. It requires Jaraxxus to be stolen during the play phase, which can only be done in a very limited set of circumstances. HysteriA uses Sylvannas and Knife Jugglers to try and get it done. After after over 90 attempts, he finally pulled it off in a live game. The Sylvannas is the most frustratingly inconsistent part of this combo. Even if you manage to pull everything off and line up the Sylvannas with one health the turn before, it still requires a one in seven shot to steal the Jaraxxus. HysteriA includes a compilation of missed Sylvannas hits at the end of the video, after spending probably hours and hours trying to get the combo to work. Just for having the patience alone to be able to stick at this, HysteriA deserves a ton of respect. If you see someone trying this combo on the ladder, you know who to blame.